Augmented reality is the visual bridge between the physical world and the digital internet. But in order for this bridge to be built, users must be empowered with adequate tools. Within the REPLICATE framework, our mission is to create a powerful augmented reality authoring tool that will allow anyone to build outstanding AR content in just a few clicks. In this post were excited to share a few insights into the development of this tool, the REPLICATE AR Co-Creativity Space. Why an AR Co-Creativity Space?REPLICATE is all about content acquisition and enhancing places and society through the use of technology. AR can augment various environments with engaging and creative digital content. With a variety of digital media, different approaches on how to place them in the world and a propitious environment for co-creation, an AR authoring toolbox is a crucial component for enabling citizens to collaboratively design and anchor augmentations to 3D spaces. The market has successfully seen the benefits of AR authoring platforms, such as the Wikitude Studio, which enables users to create interactive augmented reality experiences for magazines, newspapers, business cards, billboards, catalogues, or any 2-dimensional or planar surface. But environments around us are deeper than 2D surfaces. 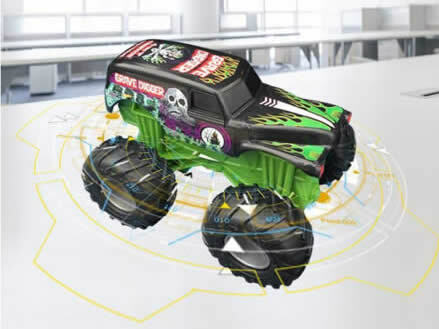 The challengeThe world around us is tridimensional and in order for AR to layer digital content on top of the physical world, the REPLICATE AR Co-Creativity Space must handle many different use cases, from the recognition of a small toy truck, to sophisticated industrial pieces, such as a hydraulic pump. On the one hand, the augmenting of physical objects around us is challenging because were dealing with heterogeneous shapes and surface. On the other hand, the process of augmenting real world objects must be intuitive for users, leaving the hard work behind the scenes with the AR authoring toolbox and its algorithms. But how to put bring all pieces of this puzzle together? Solving the puzzleThe solution is to provide a platform that allows users to effortlessly reconstruct 3D models of desired objects using REPLICATEs tools. The goal is to ease the process of augmenting objects in the AR-Space and allow creative collaborative work with simple steps. The first step towards augmenting the object or scene is creating a map for it. In this phase the user has to scan the desired object/scene, so that he/she can then define a creative AR experience. Next, the user will define which type of augmentation should be displayed on the mapped object or scene. This digital content can be 3D objects (scanned or created), videos, images, social media sharing buttons, other buttons and labels, among others. The experience can be shared among other users, who will be able to participate on the creative process of the AR experience. We hope you enjoy learning more about the REPLICATE AR Co-Creativity Space! If you have any questions or feedback feel free to drop us a line below. Spread the good news on Facebook, Twitter and LinkedIn.